May 18, 2016, London. Today Screenly, the most popular digital signage solution for the Raspberry Pi, and Canonical, the company behind Ubuntu, the world’s most popular open-source platform, jointly announce a partnership to build Screenly on Ubuntu Core. Screenly is adopting Ubuntu Core to give its customers a stable platform that is secure, robust, simple to use and manage, all available on a $35 Raspberry Pi. Screenly commercialises an easy to install digital signage box or “player” and a cloud-based interface that today powers thousands of screens around the world. This enables restaurants, universities, shops, offices and anyone with a modern TV or monitor to create a secure, reliable digital sign or dashboard. This cost effective solution is capable of displaying full HD quality moving imagery, web content and static images. Ubuntu Core offers a production environment for IoT devices. In particular, this new “snappy” rendition of Ubuntu offers the ability to update and manage the OS and any applications independently. This means that Screenly players will be kept up to date with the latest version of the Screenly software, and also benefit from continuous OS updates for enhanced security, stability and performance. Transactional updates means that any update can automatically be rolled back, ensuring reliable performance even in a failed update scenario. Furthermore, Ubuntu Core devices can be managed from a central location, allowing Screenly users to manage a globally distributed fleet of digital signs easily, and without expensive on-site visits. A compromised display can be corrected immediately and the security of devices that are in public sphere is drastically improved. Ubuntu Core also offers standardised OS and interfaces, available across a variety of chipsets and hardware. 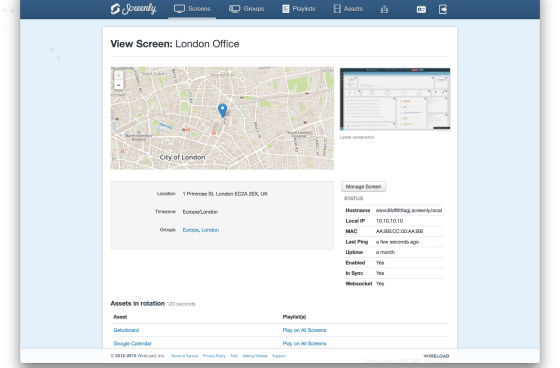 This means that Screenly can expand their portfolio of players across platforms without the costs traditionally associated with porting software to a new architecture.